A 5 ingredient, 15 minute dinner! 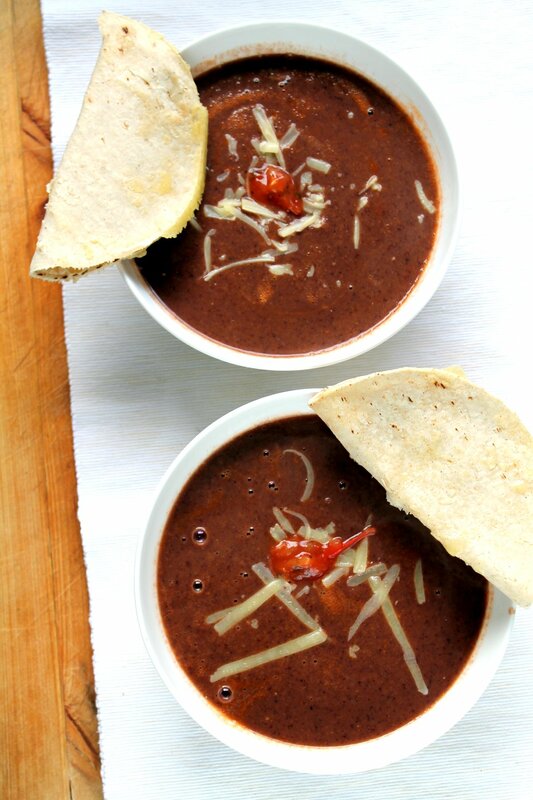 This is the easiest black bean soup you’ll ever make, and the quick quesadilla dippers come together while it heats up. You just can’t go wrong with this easy, healthy dinner! This serves 2 – double for a bigger family! Put the beans, salsa and 1 cup of vegetable stock in a blender and blend until they are smooth (or leave it a little chunky if you prefer). Add extra vegetable stock to thin it out until you achieve your desired consistency. Pour into a saucepan and heat, stirring regularly. 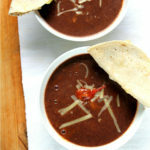 Once the soup is fully heated, ladle into bowls and garnish with extra salsa or cheese if desired. Serve with the quesadillas on the side. I got the idea for this soup, combining ready made salsa with canned beans and veggie stock, from a cookbook or a magazine… but now I can’t remember where I saw it and can’t find it in my collection of books. I will update if I ever figure out who it was! I tried to introduce my son to the concept of dipping a grilled cheese sandwich into soup the other day and it didn’t go over well. Toddlers; what gives?! Love the simplicity of this soup with the salsa starter, and with the quesadilla dipper it’s really next level delicious.